Catch up with #12 here. 6 months or so before our trip I was sat at home on the Isle Of Wight thinking of all the things we could do whilst in the US. Something that popped into my head was being in a TV audience. There are so many shows daytime and evening in America that have a live studio audience and I thought what an amazing experience it would be! So I started looking in to how to apply to be in there (if that was even possible) and what shows would be near to where we were staying! 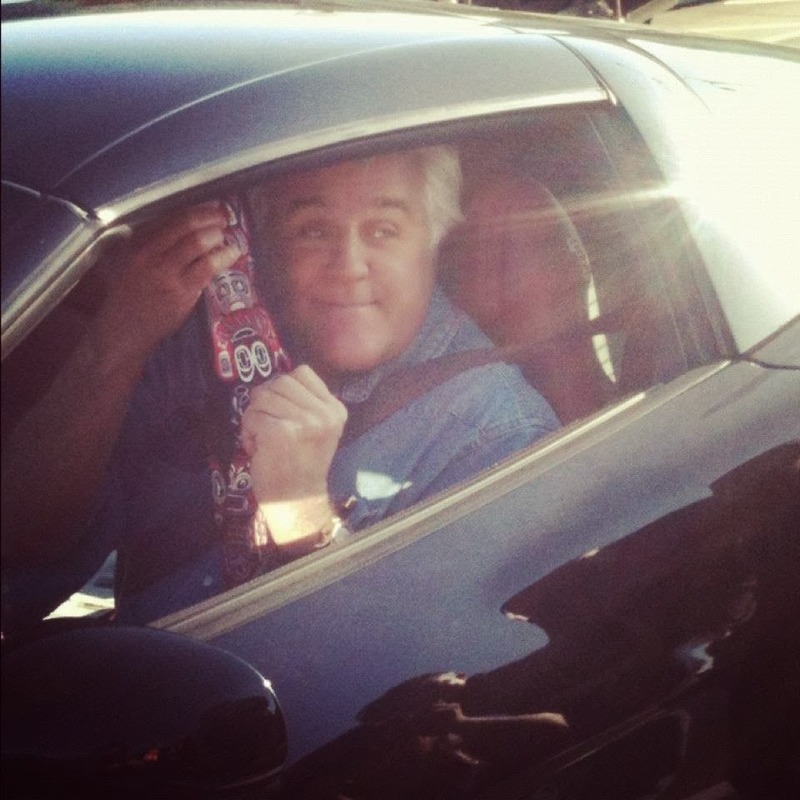 After alot of research I decided that The Tonight Show...aka Jay Leno would be amazing - he always has such amazing stars on there and he is a funny guy! So I e-mailed the show and explained what me and my friend were doing and why we would love to have tickets to the show! A couple of weeks/months (can't quite remember) I received a reply and a confirmation of our tickets to the Monday show on 12th March 2012!!!! SOOO exciting! And what was even more exciting was finding out WHO was going to be on the show. We found this out when we were in New York as it was a week before the show and the main guest was JESSICA SIMPSON! THE Jessica Simpson was going to be on the show promoting her then new show Fashion Show, her Elle cover and oh yeah - she was about 8 months pregnant! Me and my friend had always been Jessica fans so we were obviously ecstatic that we were going to be just a few metres away from her! We had our driver again, the hilarious Harry (who told us he looked like the Armenian Jay Leno... which he actually did haha! ), he sent a snazzy black car with blacked out windows to make us feel important! We had been told that it was first come and first served with the e-mailed tickets so we rocked up a couple of hours early and joined the queue! After about an hour or so we were taken in the studios and put into another queue outside the stage with a number each. These were the numbers that were going to get us in! After another, what felt like a lifetime, wait - we were heading in! We walked in backstage and after one of the crew looked at us they pointed to a bit of paper (which was the layout of the seating) and had a guide show us to our seats..... and guess what - we were FRONT MIDDLE! 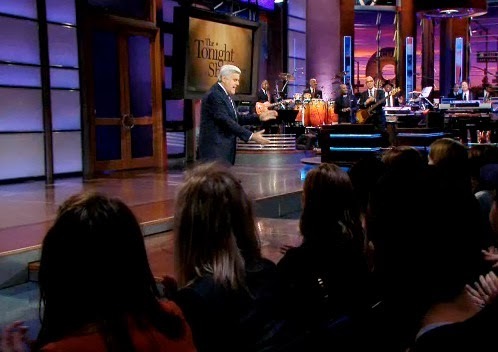 We literally could not believe it, about 4 metres away from the seats that Jay Leno and his guests were going to be sat in within the next hour - how was this real life?! We had a few people come out and get the crowd warmed up, asking who had come the furthest..... we obviously won that one - with a few gasps from the rest of the audience which made us laugh! Jay himself the came out and introduced himself and how the show worked! It was then time for it all to begin time for lots of clapping (I swear my hands were red after), lots of laughter and lots of smiles! Because we were front row we got to get up at the beginning and approach Jay at the stage when he came out for high fives - amazing! Throughout this experience I kept having to look at my friend and say... is this real? It was bizzare - we were in LA, on the Jay Leno show waiting for Jessica Simpson, not many people for a little place in England can say they've done that! That's right the first brunette there is me and the blonde next to me is my friend - Hiya Jay!! Here she came - through the gap in the wall and down the walk-way. Wowee she was pregnant but looking stunning and in still wearing amazingly high heels - impressive! I couldn't believe it is was actually Jessica Simpson!!! She chatted about her Elle cover, her new show, her pregnancy and her obsession with Slutty Brownies.... which sound incredible! After her interview it was time for the band Soja to play and then it was over! We had had the best afternoon! We hung outside the NBC studios waiting for our ride back to our hotel and in the process we spotted Jessica leave and also saw Jay for bit as he pulled over his car to chat to us all! Home we went and it was time to pack, we were leaving the day after next and we wanted to make sure we were all ready for our flight to San Fran before our last day in LA so we could enjoy it to the max! NEXT POST : Horse riding in the Hollywood hills & the 21 Jump Street premiere - yup that's right.. Channing! That sounds amazing! I keep thinking that I should get tickets for one of the TV show tapings that happen in London, I'll definitely put it on my list of things to do.